This tutorial will demonstrate how to test a generated PAW dataset against an all-electron code. We will be comparing results with the open Elk FP-LAPW code (a branch of the EXCITING code) available under GPLv3. You will learn how to compare calculations of the equilibrium lattice parameter, the Bulk modulus and the band structure between ABINIT PAW results and those from the Elk code. It is assumed you already know how to use ABINIT in the PAW case. The tutorial assumes no previous experience with the Elk code, but it is strongly advised that the users familiarise themselves a bit with this code before attempting to do similar comparisons with their own datasets. This tutorial should take about 3h-4h. When comparing results between all-electron and pseudopotential codes, it is usually impossible to compare total energies. This is because the total energy of an all-electron code includes the contribution from the kinetic energy of the core orbitals, while in the pseudopotential approach, the only information that is retained is the density distribution of the frozen core. This is typically so even in a PAW implementation. Differences in total energies should be comparable, but calculating these to a given accuracy is usually a long and cumbersome process. However, some things can be calculated with relative ease. These include structural properties - such as the equilibrium lattice parameter(s) and the bulk modulus - as well as orbital energies, i.e. the band structure for a simple bulk system. Use the same (scalar-relativistic) exchange-correlation functional. Match the Elk muffin-tin radii and the PAW cutoff radii. Use a k-point grid of similar quality. Use a similar cutoff for the plane wave expansion. Freeze the core in the Elk code (whenever possible), to match the frozen PAW core in ABINIT. Use a similar atomic on-site radial grid. We will use Carbon, in the diamond structure, as an example of a simple solid with a band gap, and we will use Magnesium as an example of a metallic solid. Naturally, it is important to keep things as simple as possible when benchmarking PAW datasets, and there is a problem when the element has no naturally occurring pure solid phase. For elements which are molecular in their pure state (like Oxygen, Nitrogen and so forth), or occur only in compound solids, one solution is to compare results on a larger range of solids where the other constituents have already been well tested. For instance, for oxygen, one could compare results for ZnO, MgO and MnO, provided that one has already satisfied oneself that the datasets for Zn, Mg, and Mn in their pure forms are good. One could also compare results for molecules, and we encourage you to do this if you have the time. However, doing this consistently in ABINIT requires a supercell approach and would make this tutorial very long, so we shall not do it here. We will now discuss the prerequisites for this tutorial. the Elk code (this tutorial was designed with v1.2.15), available here. We will use the Elk code itself, as well as its eos (equation-of-state) utility, for calculating equilibrium lattice parameters. Auxiliary bash and python scripts for the comparison of band structures, available in the directory $ABI_HOME/doc/tutorial/paw3_assets/scripts/. There are also various gnuplot scripts there. You will of course also need a working copy of ABINIT. Please make sure that the above components are downloaded and working on your system before continuing this tutorial. The tutorial also makes extensive use of gnuplot , so please also ensure that a recent and working version is installed on your system. By the time that you are doing this tutorial there will probably be newer versions of all these programs available. It is of course better to use the latest versions, and we simply state the versions of codes used when this tutorial was written so that specific numerical results can be reproduced if necessary. You can now keep the gnuplot terminal and plot window open as you work, and if you change the ATOMPAW input file and re-run it, you can update the plot by retyping the load.. command. 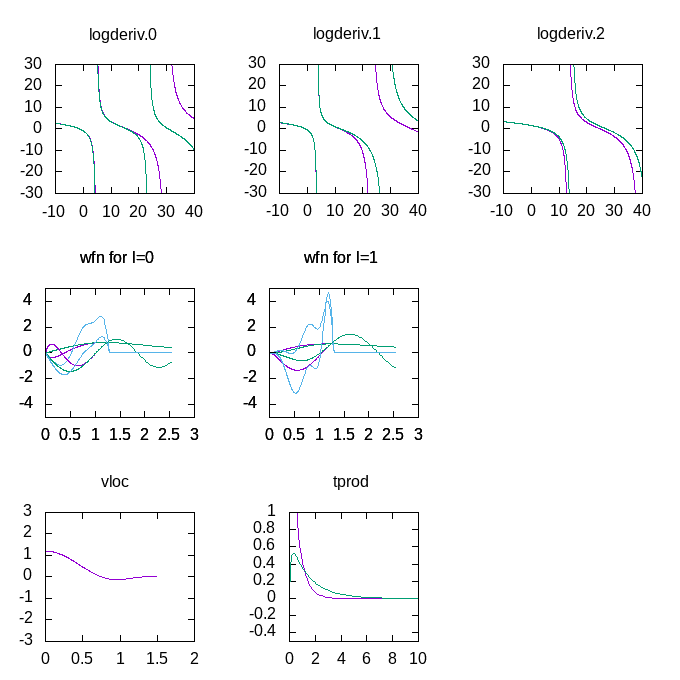 The gnuplot window plots the essential information from the ATOMPAW outputs, the logarithmic derivatives, (the derivatives of the dataset are green), the wavefunctions and projectors for each momentum channel (the full wavefunction is in red, the PW part is green, and the projector is blue) as well as the Fourier transforms of the kinetic energy and potential of the occupied states. Finally, it shows the transform of the projector products (the x-axis for the last two is in units of Ha). 2 2 0 0 0 0                                 ! maximum n for each l: 2s,2p,0d,0f.. Here we see that the current dataset is very simple, it has no basis states beyond the 2s and 2p occupied valence states in carbon. It is thus not expected to produce very good results, since there is almost no flexibility in the PAW dataset. Note that the scalarrelativistic option is turned on. While this is not strictly necessary for such a light atom, we must alway ensure to have this turned on if we intend to compare with results from the Elk code. ecut is increased in increments of 5 Ha from an initial value of 5, to a final ecut of 45 Ha. Note that pawecutdg is kept fixed, at a value high enough to be expected to be good for the final value of ecut. In principle, a convergence study of pawecutdg should be performed as well, once a good value of ecut has been found. Your values might differ slightly in the last decimals. The calculation of diamond with the current PAW Carbon dataset converged to a precision of the total energy below 1 mHa for a cutoff of about 25 Ha (this is not particularly good for a PAW dataset). Also, the convergence is a bit jumpy after an ecut of about 25 Ha, which is an indication of a) that the number of projectors per angular momentum channel is low, and b) that other parameters apart from ecut dominate convergence beyond this point. #       may be the highest precision you can get. This provides you with some statistics of the difference in the band energies. Specifically this is the average difference between a the band structure calculated at an ecut of 5 Ha (in dataset 12) and another at an ecut of 45 Ha (in dataset 92). That we have converged the dataset on its own does of course not mean that the dataset is good, i.e. that it reproduces the same results as an all-electron calculation. To independently verify that the dataset is good, we need to calculate the equilibrium lattice parameter (and the Bulk modulus) and compare this and the band structure with an Elk calculation. at equilibrium for this dataset. In order to estimate whether these values are good or not, we need independent verification, and this will be provided by the all-electron Elk code. There is an Elk input file matching our abinit diamond calculation at elk_C_diamond.in. You need to copy this file to a directory set up for the Elk run (why not call it C_elk), and it needs to be renamed to elk.in, which is the required input name for an Elk calculation. We are now ready to run the Elk code for the first time. Any text after an exclamation mark (or a colon on the lines defining data) is a comment. The keyword tasks defines what the code should do. In this case it is set to calculate the ground state for the given structure and to calculate a band structure. The block ecvcut sets the core-valence cutoff energy. The next input block, species defines the parameters for the generation of an atomic species file (it will be given the name C.in). As a first step, we need to generate this file, but we will need to modify it before we perform the main calculation. Therefore, you should run the code briefly (by just running the executable in your directory) and then kill it after a few seconds (using Ctrl+C for instance ), as soon as it has generated the C.in file. The first four lines contain information pertaining to the symbol, name, charge and mass of the atom. The fifth line holds data concerning the numerical grid: the distance of the first grid point from the origin, the muffin-tin radius, the maximum radius for the on-site atomic calculation, and the number of grid points. The subsequent lines contain data about the occupied states (the ones ending with “T” or “F”), and after that there is information pertaining to the FP-LAPW on-site basis functions. The first two numbers are the n, l quantum numbers of the atomic state, so we see that the 2s states, and the 2p states are set to valence as in the PAW dataset. in the elk.in file. If you find too few or too many states are included as valence for another atomic species, this value needs to be adjusted downwards or upwards. This is very important! If you do not comment these lines the species file C.in will be regenerated when you run Elk and your modifications will be lost. we can tell that this is not true for the rest of the points. Since the script assumes alignment at the VBM, it now separates its statistics for occupied and unoccupied bands. The uppermost unoccupied bands can fit badly, depending on what precision was asked of abinit (especially, if nbdbuf is used). The fit is quite bad in general, an average of about 0.025 eV difference for occupied states, and about 0.05 eV difference for unoccupied states. 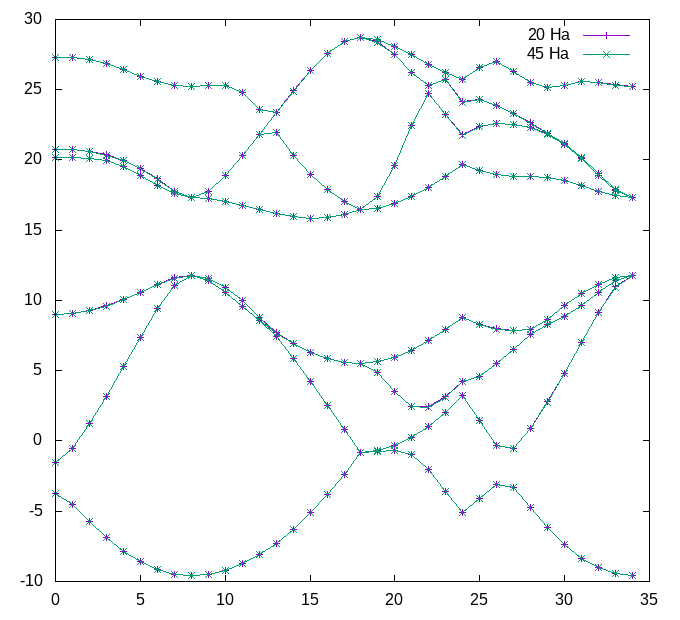 If you plot the ouput as before, by piping the above to a bands.dat file and executing the same gnuplot command, you should get the plot below. 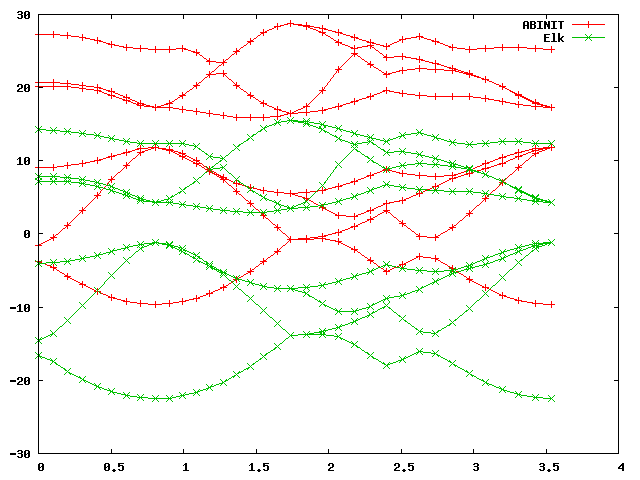 On the scale of the band plot there is a small - but visible - difference between the two. Note that the deviations are usually larger away from the high-symmetry points, which is why it’s important to choose some points away from these as well when making these comparisons. However, it is difficult to conclude visually from the band structure that this is a bad dataset without using the statistics output by the script, and without some sense of what precision can be expected. when you are determining parameters which depend on the total energy. (It can safely be set to “.true.” for band structure calculations however.) The difference in the lattice parameters when using frozen versus unfrozen core states in an all-electron calculation is expected to be of the order of 0.005 Bohr. So we see that the initial, primitive, abinit dataset is about 11 GPa off for the Bulk modulus and about 0.04 Bohr away from the correct value for the lattice parameter. In principle, these should be about an order of magnitude better, so let us see if we can make it so. Use the keyword series custom rrkj ..., or custom polynom ..., or custom polynom2 ..., if you want to have maximum control over the convergence properties of the projectors. Check the logarithmic derivatives very carefully for the presence of ghost states. like in GW calculations for instance - you will probably need at least three projectors. You might also want to add extra projectors in completely unoccupied l-channels. 2 2 0 0 0 0                             ! maximum n for each l: 2s,2p,0d,0f.. 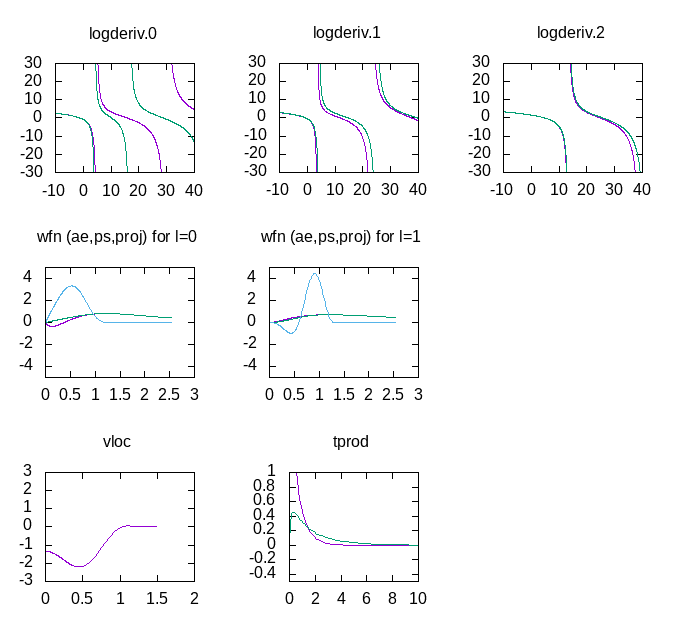 Note the much better fit of the logarithmic derivatives, and the change in the shape of the projector functions (in blue in the wfn plots), due to the more complicated scheme used to optimise them. Which shows a precision, on average, of slightly better than 0.01 eV for both the four occupied and the four lowest unoccupied bands. 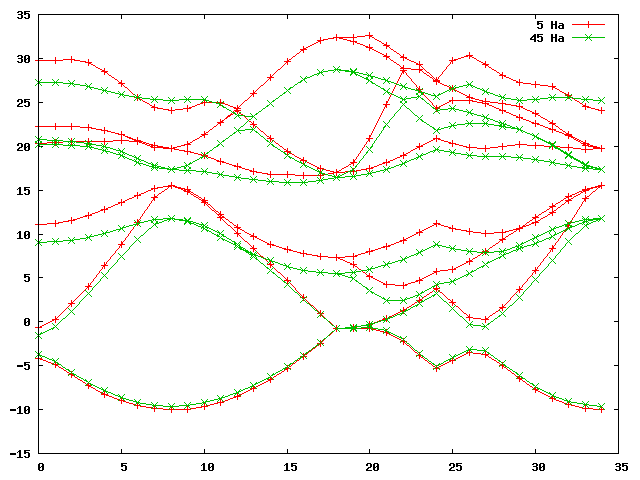 As before, you can pipe this output to a file and plot the bands for visual inspection. This is a better dataset, but probably by no means the best possible. It is likely that one can construct a dataset for carbon that has even better convergence properties, and is even more accurate. You are encouraged to experiment and try to make a better one. There is added complication if the system is metallic, and that is the treatment of the smearing used in order to eliminated the sharp peaks in the density of states (DOS) near the Fermi energy. The DOS is technically integrated over in any ground-state calculation, and for a metal this requires, in principle, an infinite k-point grid in order to resolve the Fermi surface. In practice, a smearing function is used so that a usually quite large - but finite - number of k-points will be sufficient. This smearing function has a certain spread controlled by a smearing parameter, and the optimum value of this parameter depends on the k-point grid used. As the k-point grid becomes denser, the optimum spread becomes smaller, and all values converge toward their ideal counterparts in the limit of no smearing and an infinitely dense grid. The problem is that, in ABINIT, finding the optimum smearing parameter takes a (potentially time consuming) convergence study. However, we are in luck. The elk code has an option for automatically determining the smearing parameter. Thus we should use the Elk code first, set a relatively dense k-mesh, and calculate the equilibrium bulk modulus, lattice parameter and band structure. Then we make sure to match the automatically determined smearing width, and most importantly, make sure that we match the smearing function used between the Elk and the abinit calculation. There is an Elk input file prepared at: elk_Mg_band.in, we suggest you copy it into a subdirectory dedicated to the Mg Elk calculation (why not Mg_elk? ), rename it to elk.in and take a look inside the input file. The last one is the Fermi energy at convergence. We will need this later when we compare band structures to align the band plots at the Fermi energy. We will here also need to perform several calculations (like we did for the diamond case) and we need to change the value of the scale keyword for each one. A good set of values would be: 0.94, 0.96, 0.98, 1.0, 1.02 1.04 and 1.06, i.e. 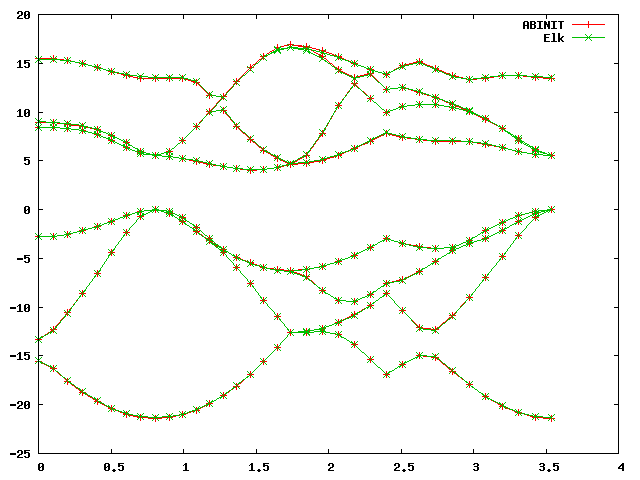 a change of scale in steps of 2% with seven values in total spaced around the experimental equilibrium lattice structure. 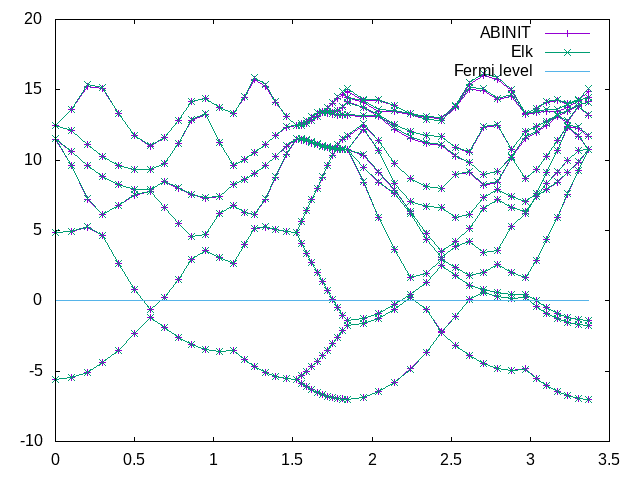 Now we have all the information needed to proceed with the abinit calculation. Note that there are not really that many projectors in this dataset, only two per angular momentum channel. It should be possible to make this much better adding extra projectors, and maybe even unoccupied d-states. If you run atompaw with this, you can have a look with the bundled plot_MG_all.p file and others like it to get a feel for the quality of this dataset. inside it. The occopt 7 input variable corresponds exactly to the Gaussian smearing which is the default for the Elk code. (In fact it is the 0th order Methfessel-Paxton expression [Methfessel1989], for other possibilities compare the entries for the keyword stype in the Elk manual and the entries for occopt in ABINIT). "Mg - bulk metallic (ABINIT)"
Again, this is a decent dataset for ground-state calculations, but it can probably be made even better. You are encouraged to try and do this. Care needs to be taken so that the logarithmic derivatives match for much higher energies than for ground-state calculations. They should at least match well up to the energy of the unoccupied states used in the calculation. The easiest way of ensuring this is increasing the number of projectors per state. The on-site basis needs to be of higher quality to minimise truncation error due to the finite number of on-site basis functions (projectors). Again, this requires more projectors per angular momentum channel. As a rule of thumb, a PAW dataset for GW should have at least three projectors per state, if not more. A particularly sensitive thing is the quality of the expansion of the pseudised plane-wave part in terms of the on-site basis. This can be checked by using the density of states (DOS), as described in the first PAW tutorial.